Vagabond is in Canada since last night! We changed time, there is now six hours difference with France. The scientists arrived in Qaanaaq two days late, due to a plane break-down in Resolute Bay (Canada). 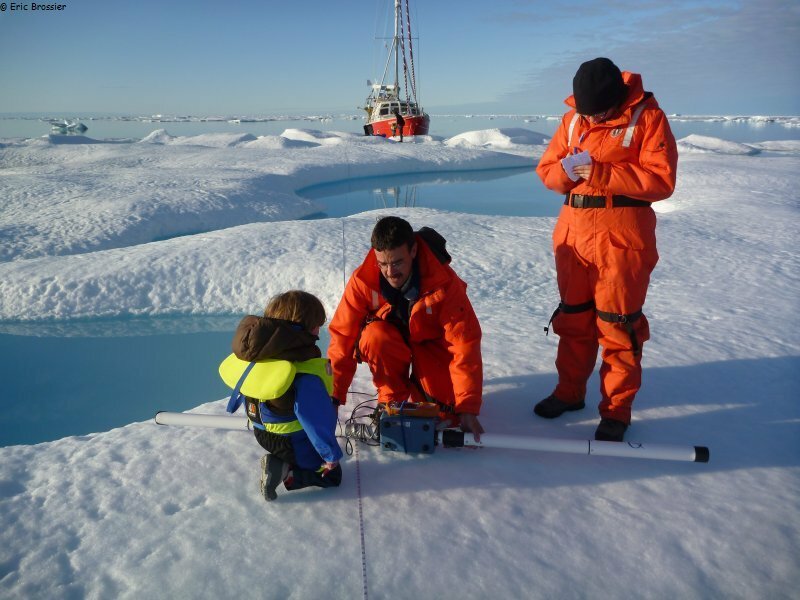 In the end, on August 8th, first day of school in Greenland, Vagabond took on board Christian Haas (University of Alberta, Canada), his daughter Léa, and his colleague Mary O'Brien (Institute of Ocean Sciences, Canada), with all their equipments. Heading North, Vagabond stopped in Siorapaluk, once more. This time, a little party was organised after the good hunt of a minke whale, villagers invited us spontaneously. A few hours later, we dropped anchor at Etah, historical site of arrival of first men in Greenland, coming from the West. Remains of stone houses are next to more recent huts, used in summer for hunting (muskox, reindeer, fox, walrus, seal...). The next day, avoiding drifting ices, Vagabond reached Littleton Island. Despite wind and fog, the first task of our mission was accomplished, for the Scottish Association for Marine Science and for the Technical University of Denmark: on top of the island, the weather station is repaired. "Congratulations, data is received now, I just had a phone call from Scotland! ", France told us when we were coming back on board Vagabond. A polar bear had only snatched away the main unit, this is why the station was not transmitting anymore since last April! Wednesday, weather conditions became gradually ideal. The section across Smith Sound was a success: eight hydrographic stations to better understand the strait between Greenland and Canada. Through this strait are some major exchanges between Arctic Ocean and Baffin bay. At each station, Mary is plunging the CTD down to the seabed (300 to 500m), while Christian is measuring, with an icedrill and an electromagnetic icemeter, thickness of the ice floe to which Vagabond is moored. Then, on Canadian side, on the small Brevoort Island, not far from Cape Sabine and Ellesmere Island, we must inspect the second weather station. This one, set up in 2009 with Henry Larsen ice-breaker, is intact. Data are downloaded, important complement to those from the station on the other side of the strait. Tonight, blue sky, wind is increasing, gust up to 45 knots, ice floes are drifting fast. An Arctic hare and his young looking at us, we found a little shelter in Alexandra Fjord, not far from the scientific station.